What if Hitman 2 didn’t task you with killing your target? The obvious, easy (and unfulfilling) answer is “well, then it wouldn’t be Hitman.” But what if there’s more to it than that? In the grand scheme of things, in the ideal execution of a mission—the murder has been given the most weight (both titularly and in terms of mission completion), but it unfolds in a blink. Hitman has always put much more emphasis on players inserting themselves into, understanding, navigating, and ultimately, destabilizing a space. Assassination is just a goalpost. But what if the goalpost was shifted? What if Agent 47 was sent not to assassinate, but to photograph? What if I told you he could do that and still be a killer? To photograph people is to violate them, by seeing them as they never see themselves, by having knowledge of them that they can never have; it turns people into objects that can be symbolically possessed. Just as a camera is a sublimation of the gun, to photograph someone is a subliminal murder—a soft murder, appropriate to a sad, frightened time. It’s a passage I wrestle with. In some moments I find myself in complete agreement, and others I want to push it as far away as possible and shout, “Oh, what nonsense, Susan!” But this seminal passage about photography and its relation to murder, from arguably the most important text about photography, from one of the most important essayists writing about photography (who also happened to have a long term relationship with one of the most well-known and regarded photographers of the late 20th century), can’t be ignored in this instance. Nor do I think it should be. The connection between photography and violence, death and violation isn’t absent in other games either. Dead Rising is a game that requires players to not only actively kill the walking dead (who, remember, were people), but to photograph them too, often in comical or further dehumanizing ways. It categorizes and grades players on these photographs. Fatal Frame has players killing ghosts with photography. And, not to totally ruin your childhood but, Pokémon Snap is a safari game about symbolically murdering pokémon. It’s a hunting game. Sorry. Interestingly enough, cameras are rare in the world of Agent 47. Security cameras exist, sure. But guns are far more prevalent than even NPCs using their smartphones as cameras. People attending the race in Miami don’t take selfies, the tourists in Mumbai don’t instagram the fabric markets or food vendors, but guns are plentiful, the people who carry them obvious, and they are quick to be drawn. Compared to the world outside of Hitman, our world, the appearance of a camera is almost shocking. The young man wandering the suburbs who will occasionally take a photograph before doing push-ups or sneaking a cigarette is unusual, and the sole photographer at the tent near the entrance to the Miami raceway almost feels out of place. Cameras in the world of Hitman 2 are as unexpected and intrusive as Agent 47’s violence is to these spaces. Guns are boring, everywhere. But a camera occupies the same unpredictable space as a coin, piano wire, or remote-detonated rubber duck. Whether you accept the idea that photography is a form of symbolic murder, it’s hard to dismiss the deliberate violence of photography, especially when it’s done without consent. Photographs can reflect horrifying, ugly truths back upon their unwitting subjects. They can (and have) destroyed careers and decimated egos. A photograph, without permission (and, arguably, even with) is often an intrusion, and it can be a profound violation. So, Sontag is on to something, because as much fun as it can be setting up a masterful, Rube Goldberg murder scenario in Hitman 2, it’s all too fleeting, and quite frankly, even the joy of this virtual kill is so old and tiresome it’s grown an unattractive patina. But what if that could be preserved, documented, stylized, made into an object that, as Sontag writes, we can symbolically possess? It becomes a grisly trophy of the hunt. And Hitman is all about the hunt. Sure, it’s easy enough to take a screenshot, or record long stretches of video or short clips of taking the target down. But they lack the intimacy of a photograph, pulling into a tight viewfinder, lining the target up in your sights, establishing a direct connection between you and your mark before SNAP! For as much as photography is a sublimation of a gun (we even use the verb “shoot” and refer to the pictures as “shots”), as abstract and metaphorical as the violence is—in a way, the deliberate intimacy of photography is far more visceral and real than even the most graphic murder Hitman 2 can offer up. Because as fascinating a game as Hitman 2 is, it puts so much distance between 47 (and by extension the player), the target, and 47’s kills that these very acts lack intimacy. They’re connected, but even when the kill is done in close proximity, it’s a ripple at the end of a long chain. Agent 47’s life is pretty bleak. The product of an experiment to create a living weapon, raised with questionable socialization in an asylum, his continued use as a compassionless, unemotive killer is to be expected. But what if the game could give him more? Agent 47 is almost always tasked with moving among people, and in social settings he’s an inflection point of potential destabilization. He’s a part of these systems of people, but he’s not a part of those people. He can’t be. But we know from his past he does have the capacity to seek connection. The potential to reflect this by giving him a camera becomes both an extension of his violence, his intrusiveness, and also the razor sadness of his existence. Including a camera in Hitman, as a usable item or a dedicated mission style, would serve to highlight the grim realities of 47’s world, but also a buried longing for empathy that he’s never really been allowed. Providing Agent 47 with a camera allows players to explore a new area of Hitman 2’s emotional and ludic landscape. 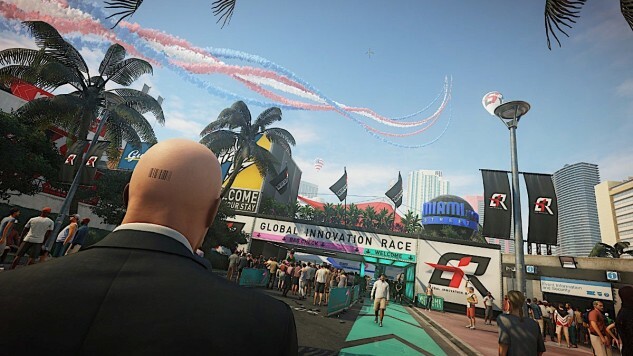 It’s an additional layer of expressive play, and as much as it provides new ways to engage with the world of Hitman 2, it offers a new way to understand and expand on these violences, exploring what we come to these games for and what we take away, and allows us to chart the psychic landscape of a lab-grown assassin’s fumbling, chaotic attempts for empathic connection.